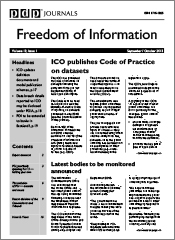 FOI Man suggests that we should view the use of exemptions, and even decisions of the Information Commissioner and Tribunal, in a different light. It’s a common shorthand in media stories about FOI that use of an exemption by a public authority = public authority secrecy. And of course there have been situations where authorities have been unnecessarily secretive. But I’d like to explain why I think exemptions – and complaints about their application – are often reported unfairly. There’s the obvious point, of course, that most people recognise that some information must be withheld to enable public services to function – and more importantly to protect the rights of the public they serve. And it’s no surprise that views of what must be withheld will differ between those making requests and those holding the information. I would argue further that even where an authority is later ruled against by the Information Commissioner or Tribunal, it may be unfair to attack them for applying exemptions in the first place. FOI Officers – and their superiors – cannot be expert in every area that might be subject to an FOI request. We are dependent on advice from others. 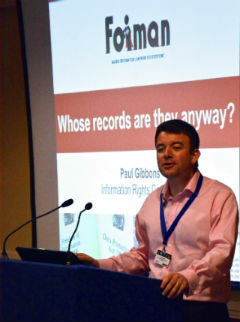 To give an example, people are often critical of public bodies for withholding information about security matters. But if a public authority receives advice from the police or security services that disclosing information will prejudice the safety of its staff or the public, it will be brave (to put it kindly) to dismiss that advice. 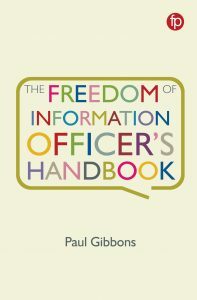 Any FOI Officer worth their salt will of course ask for evidence and may query aspects of the advice, but ultimately they are unlikely to disclose information having received that advice. Don’t forget also that in many cases, an authority has to reach a judgment on where the balance of the public interest lies. That process is subjective by its very nature. With the best will in the world, it is likely that authorities are going to reach different conclusions to the Information Commissioner on occasion. That’s why FOI provides an appeal process. If information is disclosed only as a result of an internal review or Commissioner decision, I would argue that that is not a failure of FOI. It’s how it is supposed to work. It allows the more difficult cases to receive appropriate levels of scrutiny. Separated from the chaff of the more easily answered requests, a case that reaches internal review, and even moreso the Commissioner or Tribunal, will receive additional attention and resource. The threat of enforced disclosure will provoke more serious attention from external, as well as internal, sources of information and authority. This is not to say that public authorities should not take requests seriously when they’re first received. They should be trying to answer the request correctly first time. And where there is clear guidance and case law that can be relied upon, there is really no excuse for ignoring that. But where there is significant doubt, and doubt that could put peoples’ rights or safety at risk, I find it hard to criticise the public authority that plays it safe. Even if they’re eventually forced to disclose that information. I’ve always felt that more people should ask for internal reviews of how their FOI request was handled. Complaints can feel uncomfortable for those who are involved. But they should be seen as a positive thing – from both sides. For the public authority it can be a useful way to learn where improvements can be made. For the complainant, although their answer might be delayed, they might eventually get the response they were looking for, and they will have helped the cause of other requesters. I can certainly think of occasions, as an FOI Officer, when a request for internal review, or a complaint to the Information Commissioner, might have assisted me as well as the requester – I haven’t always agreed with the approach I’ve been instructed to take. But neither side should view a reviewed decision as – necessarily – an indictment of the authority and its attitude to FOI. Complaints processes – whether related to FOI or other matters – are about reaching the right outcome, not necessarily about apportioning blame. If some of the reporting of FOI could recognise that, the whole process might become a little less confrontational, and rather more productive for everybody involved. Although I appreciate that it is within requesters rights, I think it could be unhelpful for the requesting of an internal review to be a default position. It already feels like it is with some requesters and it can seem that, regardless of the exemptions applied or how much time and resources you spend trying to ensure they are watertight, you know that the requester will request an internal review. You might as well forward a copy of your response to whichever officer carries out reviews at the same time you send it to the requester.